Considered one of the most important contemporary flamenco artists in the world, Belén Maya has pushed the limits of this art form through her constant quest for innovation. Don't miss your chance to study with her on this rare trip to the Southern California! 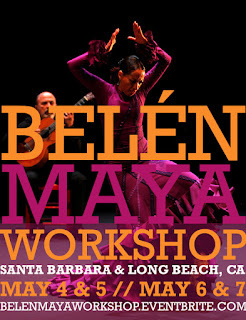 Belén Maya is the daughter of two great flamenco artists, Carmen Mora and Mario Maya. Trained since a young age by the best – Paco Fernández, María Magdalena, Goyo Montero, Rosa Naranjo, Carmen Cortés and Paco Romero among others. After spending a year at the Spanish National Ballet, she joined the Mario Maya Company where within three years she went from being a member of the ensemble to becoming the principal dancer and répétiteur of the company. She was invited by renowned Spanish film director Carlos Saura to represent the new generation of Carlos Saura's 'Por Bulerias' Video. To see her is a journey of the flamenco tradition and what she draws in time and space. flamenco in his world-renowned film 'Flamenco'. Belén’s performance in this film would become a milestone in flamenco dance as interpreted by women, opening new avenues in terms of concept, musicality, movement, and costuming. Transparent and in balance with tradition, Belén has perfected her technique and expression to become the best female flamenco dancer in Spain. 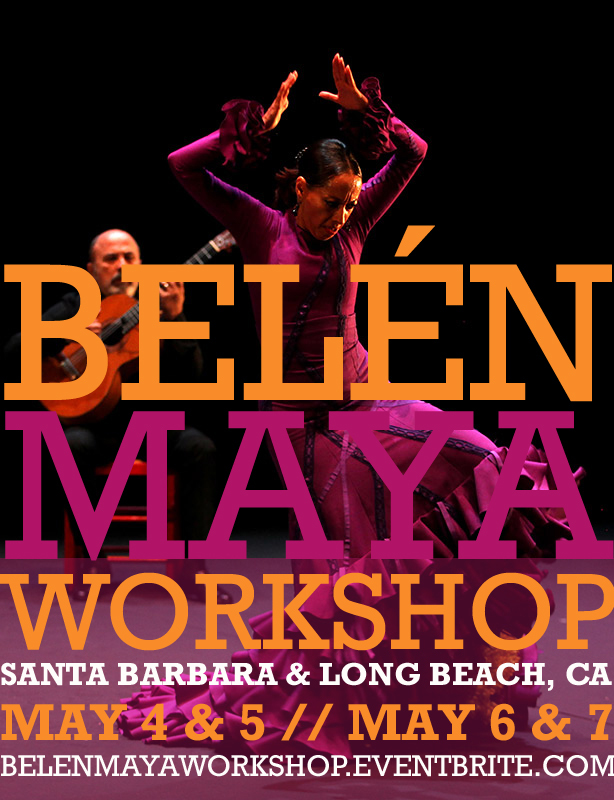 Free, creative, daring, restless and open-minded: Belén still symbolizes progress in flamenco dance. The “bata de cola” (the traditional, long flamenco dress) in Belén Maya’s art is the renaissance of the flamenco female dancer of today. It has been of the maximum expression and delicate dance which has been used in her recent shows (Dibujos, Souvenir and La Voz de su Amo). 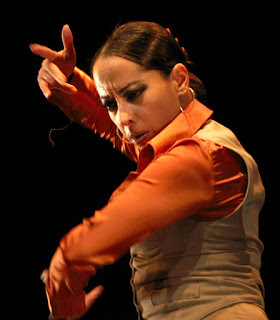 Transparent and in balance with tradition, Belén Maya has perfected her technique and expression to become one of the best female flamenco dancers of her generation. Classes taught in both English & Spanish. The General Public is welcome to enjoy this lecture on composition and the creative process in Contemporary Flamenco and Q&A. Lecture taught in English. Limited Seating Available. The cost is $20.00. BUY HERE! Free Parking in Lot just behind Studio.